Jacki Smith, owner of Coventry Candles, one of the largest suppliers of magic candles in the US, has been crafting magic candles for more than twenty years. 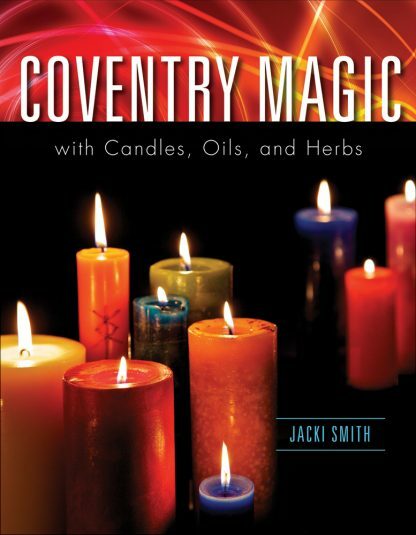 In Coventry Magic with Candles, Oils, and Herbs, she shares the history of candle magic along with the recipes, spells, and divinations anyone can use to increase love, prosperity, luck, and abundance. Coventry Magic is not your mama�s candle magic; this is candle magic for our complicated 21st century lives. Coventry Magic explores not only what color candle to use for a specific need but how to dig down deep inside and find out what that need really is. So many times what we think is the problem is only the symptom of the bigger problem. Jacki Smith uses the humor of her own life experiences to show readers how to sort through the traps and tricks they�ve laid for themselves. Her self-evaluation system helps ferret out the underlying issues and beliefs that can often sabotage magical spells. This book helps readers get to the meat of issues and solve them in a magical, life-changing way. Coventry Magic will be an invaluable reference for beginners as well as experienced magic practitioners�the ultimate candle magic reference book.